WOW! If you don't follow golf, read this story anyway. Probably the hardest assignment in all of sports is to be in the final Sunday pairing with Tiger Woods. Many, many great golfers have folded in this same situation ... including Padraig Harrington just last week. So not many gave Y.E. Yang much of a chance today when he was paired with Woods in the final group of the year's final major tournament. All the media attenton was focused on former major winners Els, Harrington, Glover, and others. When asked about his chances before the final round, Yang said [paraphrasing] ... Tiger has won 70 tournaments and I've won 1, so my chances are probably 70-to-1. The contrast between the two could not be more stark. 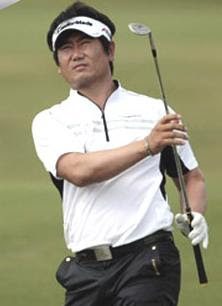 While Tiger Woods was hitting golf balls at age two, Yang did not even take up the game until age 19. Tiger was a pro golfer at age 21, while Yang served in the Korean military at 21. Tiger has had coaches since he was a boy, while Yang first had his own coach a year-and-a-half ago. And ever their appearance was different, with Yang ridiculously wearing all white with just a red chicken on the back of his shirt (seriously). Yet Yang played Tiger hole for hole - and in the end hit more big shots, including an eagle chip on 14, and a clinching approach shot on the 18th to put Woods away. Some people say golf is boring, but you never know when you might see an amazing individual performance - like today - when the most unlikely of characters became the Tiger-slayer. If you want one more reason to root for Yang, he just moved his family to the United States (Texas). GREAT GOLF TOURNAMENT! THIS IS THE FIRST TIME THAT TIGER BLINKED FIRST! !